Airbus adopted a new philosophy for the attachment of the A350’s main undercarriage as part of the switch to a composite wing structure. Each main undercarriage leg is attached to the rear wing spar forward and to a gear beam aft, which itself is attached to the wing and the fuselage. To help reduce the loads further into the wing, a double side-stay configuration has been adopted. This solution resembles the design of the Vickers VC10. Airbus devised a three-pronged main undercarriage design philosophy encompassing both four- and six-wheel bogies to ensure it can keep the pavement loading within limits. The A350-800 and A350-900 will both have four-wheel bogies, although the -800's will be slightly shorter to save weight. Both will fit in the same 4.1 m (13 ft) long bay. The proposed higher weight variant, the A350-1000 (and the A350-900R, which is being proposed to British Airways, with -900 size but with sufficient fuel capacity to allow nonstop London-Sydney flights) will use a six-wheel bogey, with a 4.7 m (15 ft) undercarriage bay. French-based Messier-Dowty will provide the main undercarriage. 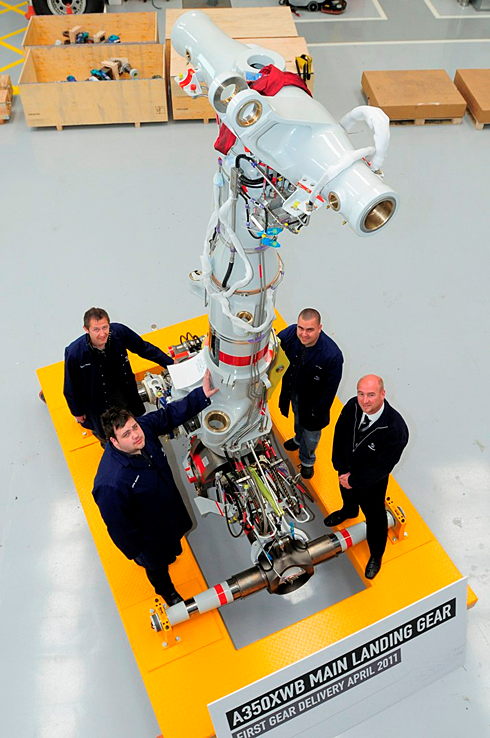 The nose gear will be supplied by Liebherr-Aerospace.